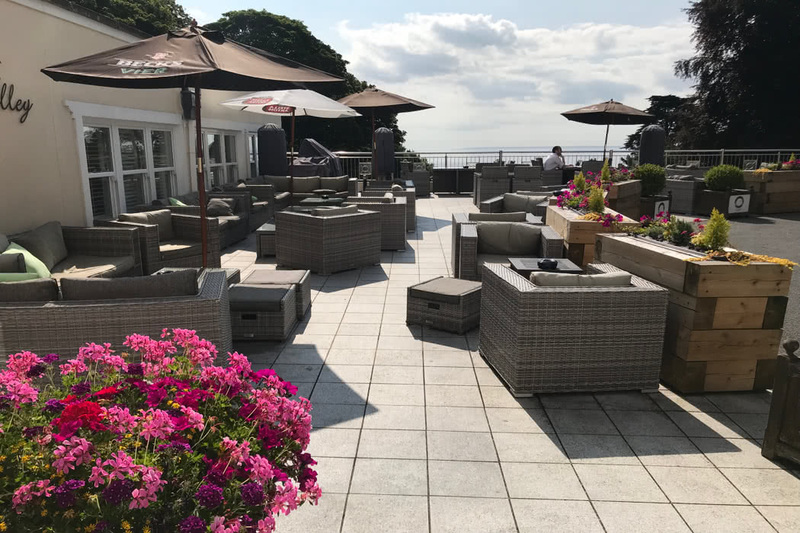 When you choose where to stay on Guernsey, you may immediately select hotels in St Peter Port for the convenience of the location, but I urge you to consider a hidden gem that remains one of our favourite hotels on the magical island of Guernsey. 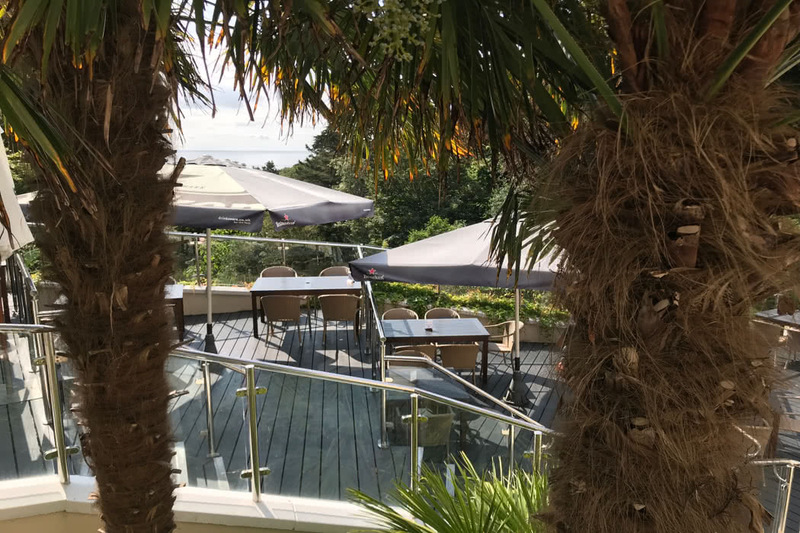 This hidden gem is the Fermain Valley hotel, nestled on the southern coast of the island, a location which is surprisingly convenient for St Peter Port whilst maintaining a green and verdant feel. 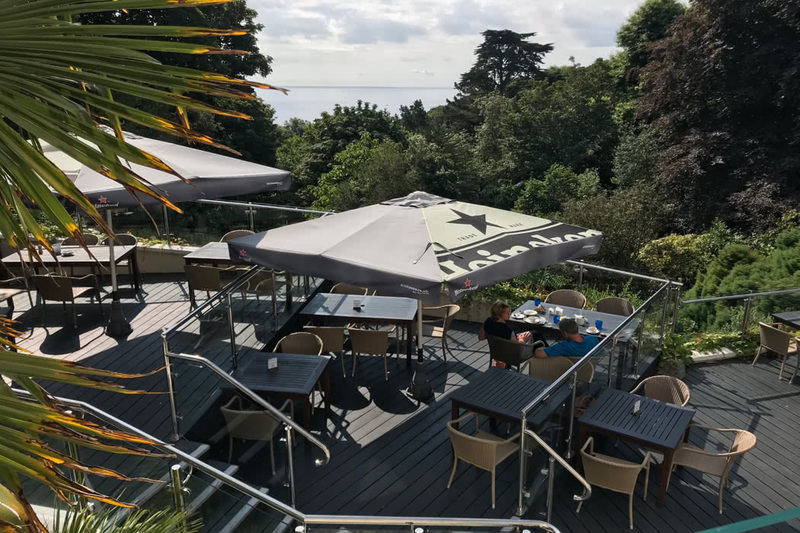 The Fermain Valley hotel, which we reviewed a few years ago (when we were not blessed with such good weather), sits down a side road in a wooded valley that overlooks the sea and Jersey in the far distance. 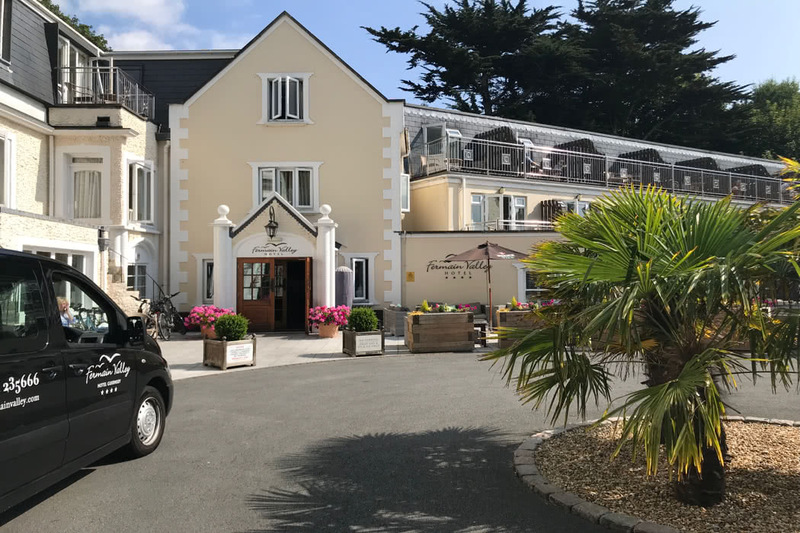 The hotel is a complete escape but remains convenient for St Peter Port because of a regular free shuttle bus which will whisk you to and from the centre of town. It takes just minutes to motor down and if you give the hotel a tinkle from town, they will pick you up too. This is a brilliant free benefit and means that you don’t need to rent a car. Closer by, the Fermain Valley hotel sits just above the stunning Fermain Bay. There are butterfly and blackberry filled clifftop walks which wind out from either side of this rocky cove, so if you are into walking, there is no better hotel choice on Guernsey. What I particularly like about the Fermain Valley hotel is the view. Like something out of a movie, most rooms look out upon a tree-lined vista which frames the distant deep blue sea. Boats and ferries cross the horizon but you feel enveloped in green at the hotel, almost like you are in the midst of the countryside yet with a view out to sea. The room we stayed in was a Platinum Room and was gorgeous. Beautifully maintained, large and with a balcony which you could sit out on with two seats and a table (tip: request a balcony as it is a joy to sit out and not all Platinum rooms have them). Little touches here make the difference. There is a decanter of sherry in the room as well as tea coffee and biscuits and The White Company toiletries can be found in the bathroom. Downstairs, most of the communal rooms and restaurants also look out upon the view. There are also layers of terraces which wrap their way down the hill, packed with seats and umbrellas and a fabulous place to have a drink and a bite to eat (pictured above). We did not use the indoor pool this time as the weather was too nice, but this is also a nice facility and something that most St Peter Port hotels don’t offer. The Fermain Valley hotel is a peaceful and sophisticated hotel choice with immaculate rooms and beautiful views. On your next trip to Guernsey, you will be missing out if you don’t spend a couple of nights here.